SoulStice‘s latest album, “Beyond Borders” features collaborations with artists across Europe and his single “Strange Kinda Love” has received international airplay after winning the John Lennon and Billboard songwriting contests with the video receiving airplay on nationwide television. This year, SoulStice‘s music was featured in the Oscar-nominated film “The Blind Side” starring Sandra Bullock as well as on a recent episode of NCIS LA. To say that SoulStice spits knowledge would be an understatement; after all, he does have a Masters Degree in Electrical and Computer Engineering and holds down a position with the Department of Defense. Recently named a “Modern Day Technology Leader” at the 2010 Black Engineer of the Year Awards, SoulStice has assumed a unique position of leadership in two very different fields – engineering and music. Since he started his independent label, Wandering Soul Records, SoulStice has been a fixture on the hip hop scene with 5 LP releases, features in just about every major hip hop publication and website and tours in the US, Europe and Japan. 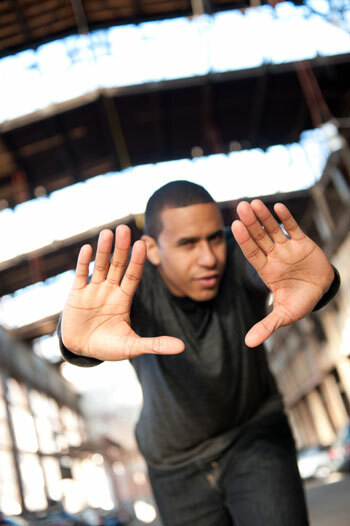 Since the release of his 2003 debut album, North by Northwest, SoulStice has been featured in XXL Magazine, The Source, URB, Scratch, Elemental, Ballerstatus.com, Allhiphop.com and most other tastemaker hip hop publications and websites. Renowned journalist Tavis Smiley has even taken an interest, dubbing SoulStice and his music as “enlightened…outside the norm.” Energetic live performances and chart-topping college radio singles have served alongside the press coverage to create an impressive buzz. In early 2006, SoulStice and Wandering Soul Records caught the interest of Neil Levine, head of Urban Marketing at EMI, leading to a national distribution deal through EMI/Caroline. SoulStice has also developed a loyal overesas fanbase, leading to several international tours and distribution partnerships, including Universal Music in Japan. 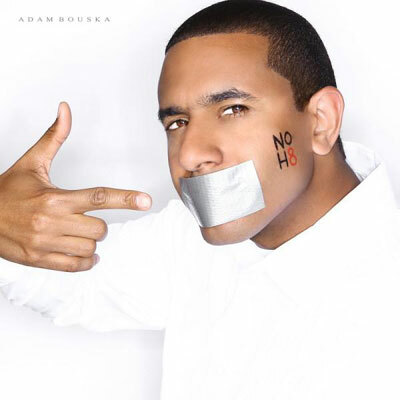 SoulStice’s song, “That Thang” was featured in the Oscar-Nominated film, “The Blind Side” starring Sandra Bullock, and his song “Always” was featured on the CBS hit show NCIS Los Angeles. Sharing the stage with artists as diverse as John Legend and Wu-Tang Clan has set the proper foundation for SoulStice to shine through high-energy live performances throughout the US and Europe. 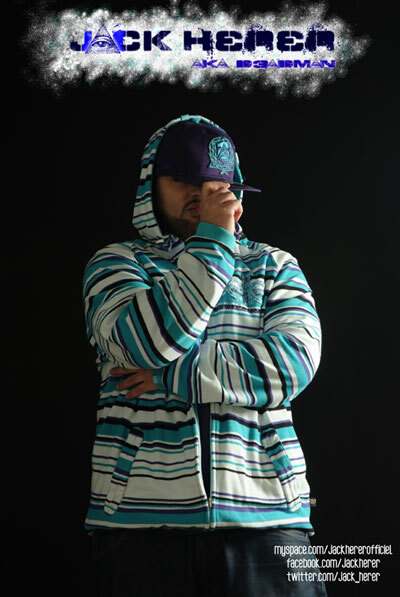 SoulStice has collaborated with the legendary AZ of Illmatic fame, Cuban Link, formerly of Terror Squad, and many producers, both well known and up-and-coming. As a result of his music industry experience SoulStice was invited to become also a voting member of the Recording Academy and has attended several Grammy Award shows in LA. Combining a soulful blend of Chicago funk and east coast boom-bap, SoulStice makes what he insists is “commercial music” with awareness and attitude. Through this unique brand of hip hop, SoulSticedocuments his one-of-a-kind journey from the windy city of Chicago to the nation’s capitol of Washington, DC, and across the globe. 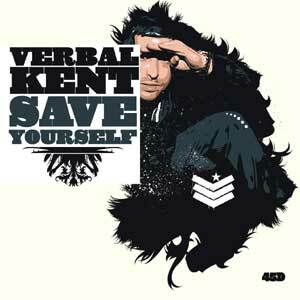 After the successfull february 2010 Save Your Friends Tour, Chicago’s Verbal Kent is getting set to return to Europe to tour in support of his latest work, “SAVE YOURSELF“. Perhaps his most powerful release yet, “SAVE YOURSELF” includes guest appearances from some of Hip-Hop’s greatest and most Legendary performers. Features include MASTA ACE, EDO G, and SADAT X..with production from PETE ROCK, !LLMIND, MARCO POLO, and M-PHAZES. Verbal Kent is set to return to Europe for the 4th straight year- ready to re-visit conquered territory, and explore new terrain. “SAVE YOURSELF” drops January 11th 2011. His partner in Crime LANCE AMBU will be joining Verbal once again, along with LORD FAZ on the decks. 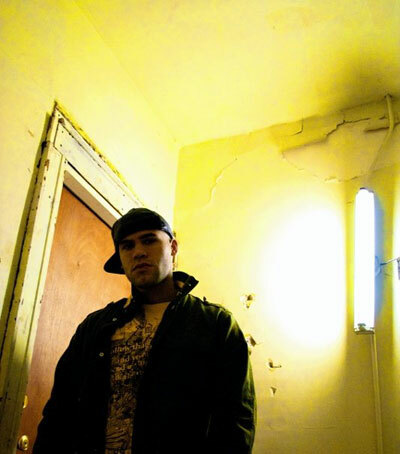 And even before Verbal Kent‘s sixth solo album, Save Yourself, is released, plenty of real hip-hop connections have flourished. With production from Pete Rock, !llmind, Marco Polo, and M-Phazes, as well as guest spots from Sadat X, Edo G, and Masta Ace, Verbal Kenthas made a record with artists that he respects and admires in the way that he wants to be respected and admired. “I’m kind of stupid for it,” he jokes, “but I really mean it when I say that my only long-term interest is to be part of hip-hop history. 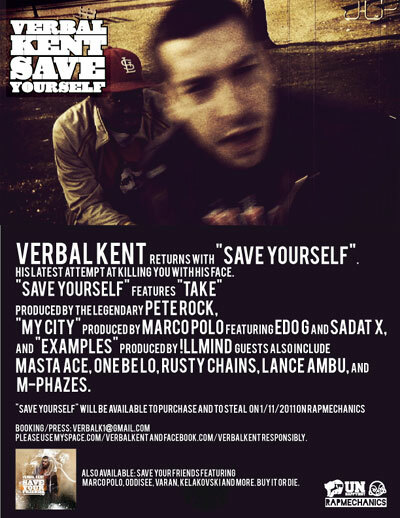 I’m not trying to get picked up by a big label—I could care less, I’ve never even shopped a record before.”Save Yourself is Verbal Kent‘s most accessible record, without sacrificing an ounce of the hard-bodied and heart-felt hip-hop classicism that fans around the world have come to expect. From the gritty neck-breaker “Dinner Party” to the timeless bounce of the Pete Rock-produced “Take,” Verbal Kent continues to find new ways to express himself within rap’s formula. “I don’t settle ever. Every line is a new combination of words that reflect who I am and what I think; I never just ‘lay something down. '” On album highlights like the Edo G and Sadat X featuring “My City,” the three emcees provide hometown tours through Boston, Chicago and New York, and Verbal sounds right at home among true legends. Getting his start with Chicago’s hip-hop band, OMU, at the precious age of 19, Verbal finally got serious in 2003, releasing his debut album a year later. What Box was acclaimed both locally and internationally, as the Gravel Records release caught press from URB and Vibe, among others. Things were really looking up for Verbal Kent, which made the attempt on his life even more significant. In 2004, “something of a friend” slashed Verbal‘s throat, missing his jugular by a centimeter. The event forced him to re-evaluate the way he trusted people, but also pushed him into a never-stop work ethic that has resulted in countless tours, numerous side projects and five albums in as many years. He’s shared the stage with KRS-One, Gza, Cypress Hill, De La Soul, The Pharcyde, Redman, Atmosphere and more, bringing his brand of hot spitter hip-hop to Europe and across the United States. It’s a resume that many rappers aspire to and few attain, but the craft is what really matters to Verbal Kent. SAY YES which is entirely produced by Statik Selektah. They will be touring september 2010, book them right now! Starting out as two randomly selected roommates, Quite Nyce and SEEK formed a rap duo, RADIx, andwent on to form a successful career. Since their formed bond,they have released over 12 projects on their self-funded record label Abstrak Recordings, toured throughout Europe 3 times and toured the USA countless times. They officially formed RADIx in 2003 and have continued to be supported independently to reach their fan base directly. 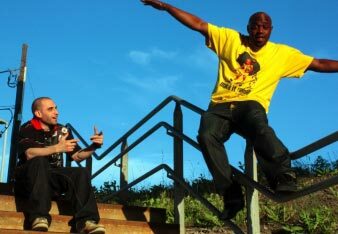 They received critical success with their debut album “The Staple” (2006), which featured Mr.EON, Akrobatik, Insight, DJ JS1, and Mista Sinista. RADIx has been featured on MTV2, URB Magazine, Performer Magazine, Elemental, and all major Massachusetts newspaperpublications. In 2008, singles from RADIx’s album debuted on Fox. RADIx, is now set to gather even more success with their second studio album. They have enlisted one of the top producers in the game, Statik Selektah, to produce the entire album. Their debut single from the album “The Return” has already been featured on major hip hop sites such as 2dopeboyz.com, Nahright.com, and Kevinnottingham.com. Renewed motivation to get the type of acclaim they feel they deserve has already launched RADIx back into the spotlight. In 2010, RADIx will cement themselves as one of the best groups in the game. They both know that it will take hard work and dedication but that is nothing new to a group that started in a dorm room in 2003 and went on to perform in front of hundreds of thousands of people thus far in their career. UK-born, Jamaican-rooted, New Jersey native, Cymarshall Law is an MC whose diversity and versatility are undeniable. 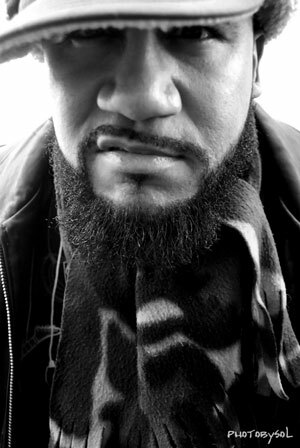 His 2007 debut album on Rawkus Records, Hip Hop in the Flesh, paved way for nationwide and international tours including Vans Warp Tour, and performances at Scribble Jam, Rocksteady Reunion and the DMC DJ Battle Competition. 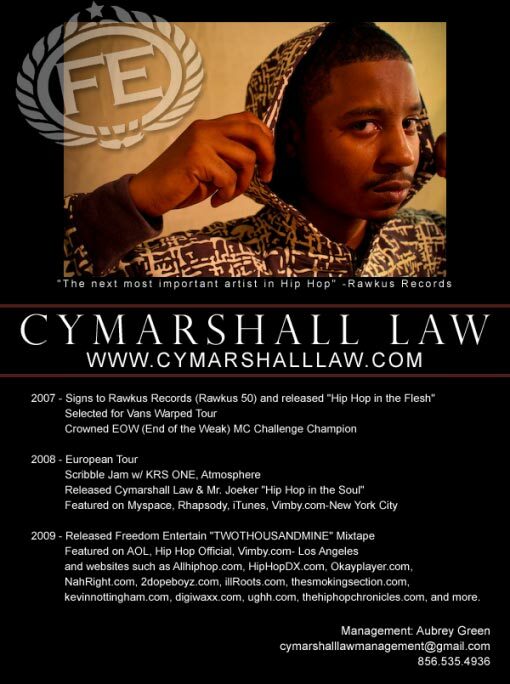 The album elevated Cymarshall Law to featured placement status on iTunes (U.S. and UK), an MTVu nomination for his video for single “King With 4 Wives” and recipient of The Source Magazine’s Unsigned Hype award. Cymarshall Law, né de parents jamaïcains, quitta l’Angleterre à l’âge de 9 ans pour les USA. C’est là que commença son amour pour le Hip Hop. Cymarshall a performé dans un bon nombre de villes aux Etats-Unis et en Europe se créant un nom grâce à ses lyrics, son talent de MC et ses prestations énergiques et charismatiques. En 2003 Law a gagné une battle de emcee à Tower Records, Philadelphia, dont les membres du jury étaient les Black Eyed Peas. Il a également hoster et rapper lors du mondial du DMC en 2006 au Canada. Il a participé au légendaire Vans Warped Tour été couronné au EOW (End of the Weak) de 2007. C’est suite à tout ça qu’il a été repéré et signé chez Rawkus. Depuis, on le retrouve au Scribble Jam de 2009, en tournée en Suède, en Hollande, en Espagne, booké au festival du Hip Hop Kemp en Tchekoslovaquie. Son dernier album en date “Hip Hop In The Soul” produit par Mr Joeker a reçu l’approbation du public et de la presse spécialisée confirmée : Okayplayer.com, Kevinnottingham.com, 2Dopeboyz.com, Artofrhyme.com, schememag.com, Thatshiphop.com, Myspace.com, Vimby.com ou encore hiphopoffical.com.Cymarshall Law représente ce que beaucoup regrettent dans le Hip Hop d’aujourd’hui : le “story-telling”, la controverse et l’originalité , le style. 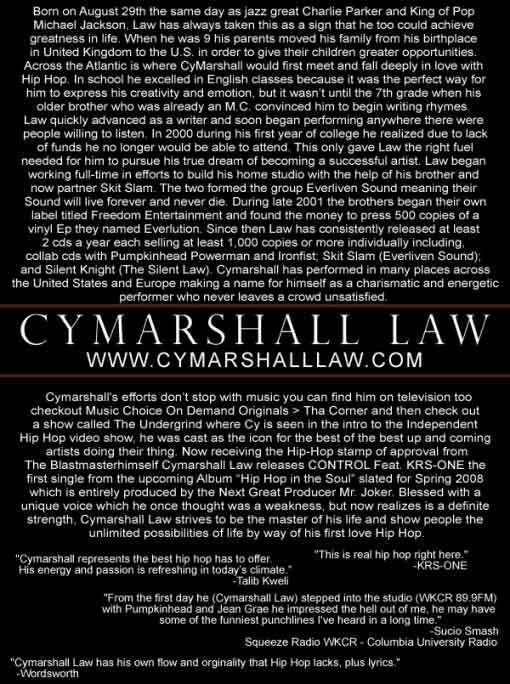 Cymarshall Law was born to be a star. This spring, Cymarshall Law will release album Freedom 2 (Freedom Entertainment) as part of rap group Everliven Sound, comprised of Cymarshall Law and brother Skit Slam. He also looks forward to an additional solo album release later this year. Brave New Rap is exactly what the rap game needs—proving to the world that Hip-Hop is alive; and more then well. Verbal Kent, natif et citoyen de Chicago, est un rappeur méconnu du grand public, mais dont l’activisme dans la sphère est d’une indéniable qualité, ses performances auprès d’artistes reconnus, sinon mythiques, témoignent de son potentiel artistique, de sa créativité et distinction individuels, en tant que emcee passionné. Les dites collaborations de Verbal Kentparlent d’elles même. The GZA, KRS 1, Wordsworth, De La Soul, Redman, The Pharcyde, One Be Lo, Atmosphere, Mr Lif, Rhymefest, Brother Ali, Evidence, The Boot Camp Clik, Swollen Members, Ed Og, Styles Of Beyond, Sadat X, Blade, Akrobatik, Little Brother, pour ne citer qu’eux. Oddisee, J-Zone, kaz 1, Roddy Rod, DJ Prizm (R.I.P), Marco Polo, 5th Element, K-Kruz, Copperpot, Overflo, Earmint, Panik Of The Molemen, Maker (GLUE), entre autres. Ses débuts remontent à l’âge de 18 ans, tandis que Verbal Kent s’intéresse de très près au Hip Hop. Nous sommes dans les toutes premières années 90, époque où le Mouvement connaît son apogée et envahit tous les foyers, mondialement. Ce qui est dans un premier temps un loisir mute rapidement en une obsession, V.K. devient addict, sa vie sera dédiée à la musique, au Rap. 18 ans donc. C’est à cet âge qu’il déménage de chez ses parents, demeurant à Chicago, mais indépendant et libre de s’adonner de façon permanente à la recherche de son style propre, son identité artistique, soit celle d’un homme curieux et réfléchi. A force de travail, Verbal Kent devient un emcee dont les rimes témoignent de sa culture musicale et générale, féroce dans son flow, l’impact est massif. A son actif, plus de 250 performances scéniques aux USA et outre Atlantique, à l’occasion de « guest appeances » dans un premier temps, puis de ses propres tournées promotionnelles. Hors scène, où il se donne à son public sans retenue ni ménagement, fort de son rap bien trempé assorti de productions égalitaires, c’est à un homme humble, approchable et enthousiaste dont nous avons affaire. Sommes toutes, méritant à être connu et reconnu, Verbal Kent compte parmi ceux qui donnent gracieusement, apportant satisfaction à quiconque sait recevoir. – Eat Them (Features over 20 tracks of collaborations between Verbal Kent, Rusty Chains, Lance Ambu, Alltruisms, Roadblok, Doomsday, E-Brown, Moodswangz, Kang the Konqueror & Elfamail. Production by J-Zone (2 tracks), Kaz1, DJ Prizm, Roddy Rod, 5th Element, Kut-O, Earmint & more). VERBAL KENT et L’AMOUR DU RAP. Dans la lignée de 11 ans d’activisme conceptuel et engagé, « BRAVE NEW RAP » est le quatrième opus de Verbal Kent, entièrement produit par Kaz One. Un régal. Là, il faut laisser tourner en boucle avant de saisir à proprement dit. Sont de rigueur: une oreille avertie en termes de beats, de rap, et un bon américain pour se manger les lyriques, tantôt second degré, où très sérieux quant à notre condition humaine et/ou d’automates sur la Planète Chaos. Le tout ponctué de featurings d’excellente graine, au final, rien à redire. 1998, Verbal Kent, citoyen né et demeurant toujours à Chicago, s’exprime officiellement chez Gravel Records avec son 1er solo, «What Box». D’emblée, de l’agitation, des idées, du concept à fleurir, de la personnalité, un esprit empreint d’une adolescence érudite de l’apogée du hip hop, soit les 90’s, assorti de sensibilité sur son environnement social, politique même, V.K. a tout pour nous faire du bien. «Brave New Rap» ressemble, je crois, à ce que j’ai toujours aimé et me manque dans les bacs actuellement: un album ENTIER à garder dans son coeur, sa vie.» Pas de «3 titres sur 20» à retenir donc, mais 17/17. Point. V.K. compte, à 31 ans, juste une décennie de musique en collaboration avec des renoms comme Oddisee, Rusty Chains, Alltruisms, huh, la liste est longue en producteurs et complices microphoniques : il n’est pas en reste. La caractéristique de ce dernier opus, c’est un seul homme à la production, soit Kaz One. Une performance de taille vue la variété sonore des titres, avec toujours autant de fidèles en guests pour faire de l’ensemble un très bon cru de hip hop A.O.C. et dont il aura fallu 6 mois pour la coordination et réalisation finale. «J’aime cet album, il a par ailleurs reçu un très bon accueil jusqu’ici.». À ce jour, Verbal Kent revient de 2 mois de tournée, notamment en Europe, et travaille déjà sur deux nouveaux projets. «J’ai aimé voyager hors des U.S. Il me semble qu’en Europe, le public est plus fidèle aux sources du rap, son énergie, sa valeur originelle. Aussi un étranger est apprécié pour sa venue, son dynamisme. J’aurais aimé faire plus de dates, voir plus de vos villes! Ici aux U.S.A., le public est parfois plus sceptique…» Déjà, Verbal Kent travaille sur deux nouveaux projets avec deux autres producteurs: l’un avec Wizzard, UK, «ce mec a un talent incroyable», l’autre avec Varan, USA, avec qui il a déjà collaboré. «Nous nous envoyons nos travaux respectifs, je ne sais pas encore ce que ça donnera: deux albums, un double… J’y travaille dur chaque matin.» Alors heureux V. K.? «En tant qu’individu? Oui je suis bien dans ma peau. Mais en tant qu’artiste, je crains que ça ne se produise jamais, le hip hop, la musique évolue sans cesse. Sinon je n’ai plus qu’à prendre ma retraite ! » Ok Kent, on attend les prochains Verbes alors. Ide, Jise, Alucard and I Am Many of the Creative Juices crew are coming together for the “Blood Sweat and Years” tour. 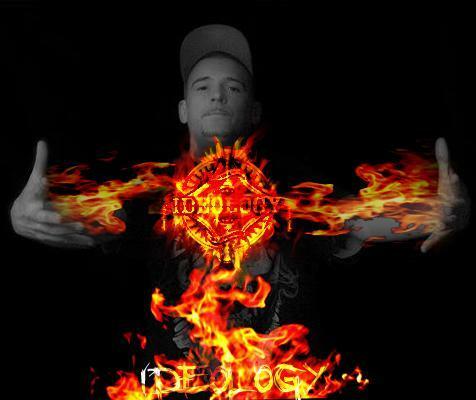 If you are a fan of underground hip hop than you know who the Arsonists are, and if your familiar with the Arsonists, than you have already heard of Jise. He has just released his second solo album “The Chronicles 2” (a top selling indi release) and is ready to hit the road. Next up is label owner, beat maker, and mc, Ide! For the past 10 years Creative Juices have been putting out music on a monthly basis, and Ide is the master mind and work horse behind it all. Aside from working with nearly every New York legend the underground has ever produced, he has somehow managed to compose 3 solo albums, (one being the highly anticipated Ideology set to drop the summer of 2010) and build a huge fan base overseas, especially in Germany. MC, Artist and founding member of the Creative Juices crew. 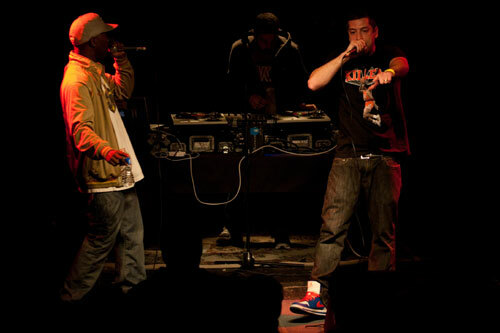 IDE and Alucard have opened for acts such as Heltah Skeltah, Jeru Da Damaja, Keith Murray, Masta Ace, R.A. The Rugged Man and many more. His lastest release “Watch Them Fall” has acquired him a strong buzz at no time at all. Alucard has gained his stripes in NYC as both a strong lyricist and graphic artist. Last but certainly not least is NYC legend and newest member of the Creative Juices crew, I Am Many! Formally known as: “Many Styles”. 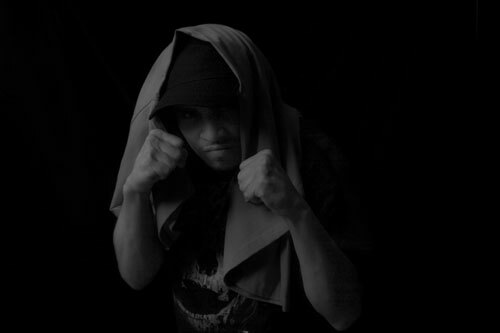 Many earned a name for himself in the Nyc battle scene in 98 (Including classic battles against Jin, C Rayz Walz, and Immortal Technique) and has been performing ever since. He has shared the stage with with nearly everyone from Big Daddy Kane, to Aesop Rock, M.O.P. Mos Def, Talib Kweli, and the list goes on. His first album is considered by many to be a classic, His shows are a must see, and with his latest release “The Human Experience” just dropping on Creative Juices he is ready to hit the road, this event is not to be missed! De retour en France d’un long pèlerinage a Amsterdam, Jack Herer alluma la radio aussi vite qu’il l’éteignit, cela lui suffit pour constater l’agonie du rap français. Ne croyez pas qu’il est là pour le sauver !!! Mais il est urgent de combler le manque des Hip Hop junkies avec du flow, du fond, du son lourd et du show !!! Son 1ermaxi « STOP » sortira courant 2010. Davinssi et Everydayz pour les prods, sur scène il est accompagné de Midnight et de ses deux Djs, Loconels & Skratchon, la combinaison parfaite pour un show fumant ! Les pendules seront remises a l’heure du Hip Hop ! Depuis plus de 10ans Jack Herer peaufine son art de MC du studio au live. 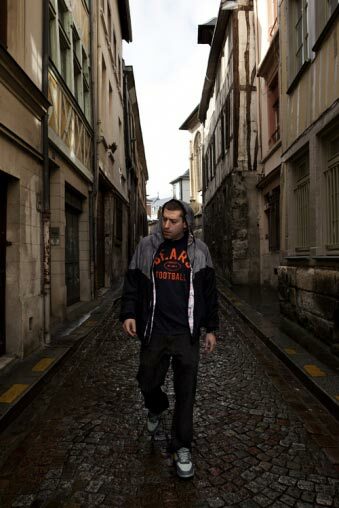 On le retrouve sur plusieurs mixtapes et albums («Rap Smoking » de Suen, « French Touch » vol. 1&2, etc…). Son 1er opus solo « N.D.E » sorti en 2008 s’écoule sous le manteau à plus de 1500 exemplaires. Fort de plus de 200 représentations en France comme à l’étranger (Norvège, Bulgarie,…), il a partagé la scène avec de nombreux artistes tels que, Oxmo Puccino, Sinik, Kenny Arkanas, Killah Priest (Wu-Tang), Les Sages Poètes De La Rue, Fabe et La Scred Connexion, K’Rhyme Le Roi, La Clinique, Anti-Lopsa, TTC, Kabal, La Brigade, Les Gourmets, Human Spirit, N&SK, La Sale Equipe, Radix (Boston) , L’Algerino, Ulteam Atom, Fik’s & P’Kaer, Eska, Posse 33, Verbal Kent (Chicago) et bien d’autres.